Looking to get away from the hustle and bustle? HAVE WE GOT A PLACE FOR YOU! As you walk into our unit you will be tranquilled by the warm, inviting, and relaxing colors and furnishings as well as the magnificent views. The living room is furnished with an elegant sofa and chair for you to relax in while watching your favorite program on the flat screen TV. Meals can be prepared in our fully equipped kitchen and then enjoyed at the beautiful raised dining table and chairs or at the kitchen counter/bar. The full sized refrigerator will certainly come in handy for all your perishables. Enjoy the comforts of home when you enter the master bedroom. You will be welcomed by the soothing colors and furnishings of this elegantly decorated room. We have provided a TV which is mounted on the wall for comfortable viewing. Our unit is also furnished with full sized twin bunk beds as well as a queen size pullout sofa bed. A washer & dryer is also provided in the unit for your convenience. Fun can be had at the heated pool which is on the grounds of the Windancer as well as a BBQ grill that overlooks the gulf. The views are to die for!!!! 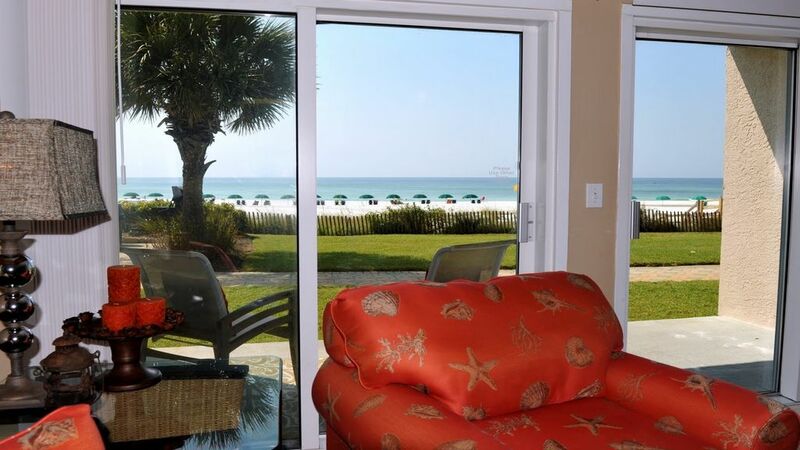 Emerald clear waters, crystal white sand beaches all can be viewed from the patio of our unit. If you're lucky you may even see dolphins frolicking in the gulf. Come and enjoy the smells, sounds and breathtaking views of the Gulf of Mexico. Windancer is conveniently located near the famous Silver Sands Outlet Mall as well as many restaurants and shops. You're bound to find something to appeal to everyone in the group. Complex sits right on the beach, no streets to cross, you can see the water & listen to the waves from the balcony. Condo and view are beautiful! Michelle is a fantastic host and truly wants to ensure you enjoy your stay. I highly recommend! Great stay. Great condo. Very comfortable and Michelle was great to work with. The property was very nice and steps away from the beach. I would stay here again! Beautiful location- condo was great! We were very happy with our condo. The king bed was very comfy!! Condo was very clean- the stove needed to be leveled that was the only draw back. Enjoyed our stay. Great location and the beach is not too full. Does come with a beach chair set but they are first come first serve so make sure to get one early. Such a great condo and location. Loved that this was a first floor rental so no going up and down stairs with little ones. Loved the private enterance to the beach and that there was a private pool. Such a great location. Renters as well as all unrelated guests must be 25 or older unless accompanied by a parent. NO pets allowed. NO smoking allowed.